Bordeaux (AFP) - An Iranian woman, who became the country's first female boxer to win an international fight, intends to stay in France, her spokesperson said Wednesday, adding an arrest warrant had been issued against her in Iran. Khadem, 24, had been due to return to Tehran, where she works as a fitness trainer, following her victory Saturday over 25-year-old Anne Chauvin of France in the western town of Royan. In the bout Khadem was bare-headed and wearing shorts, defying rules in Iran that female athletes should be covered in line with its Islamic laws governing women's dress. There was no immediate comment from the Iranian judiciary but the Iranian boxing federation distanced itself from the female boxer. 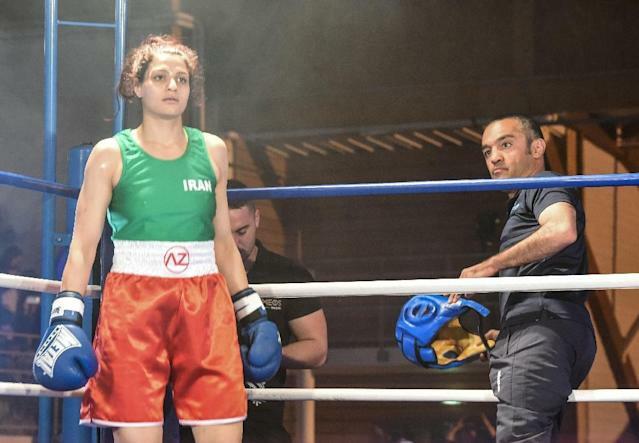 Hossein Soori, head of Iran's boxing federation, in a statement issued by the Ministry of Sports and Youth, said Khadem was not a registered boxer in Iran and "in the view of the federation all of her activities are a private act." The federation said it "strongly" denied she was blocked from returning from France or that she would be punished if she re-entered Iran. However they must always obey Islamic dress rules, which means that some sports such as wrestling, boxing and swimming are off limits in international competition.